Companies often use brand quadrants to position their brand and figure out how they want to convey their message. The purpose of a brand quadrant is to find the balance between centrality and distinctiveness. By finding this balance it will help customers better understand what this company does and sells. Earlier this year, we had the honor of working with Full Spectrum, a homecare agency here in Madison. They were a startup at the time, and they gave us the opportunity to design new and unique marketing collateral for them. In collaboration with marketing consultant Marc Glazer from Three Suns, we did just that. Full Spectrum was able to hit the ground running with a wide array of consistent collateral that set them apart from the competition. It’s important for businesses to think about the messages that their brand images send. By positioning a brand strategically, a business is able to communicate effectively with the target audience and help them stand out. After a marketing consultation, we determined that Full Spectrum’s brand should convey warmth. 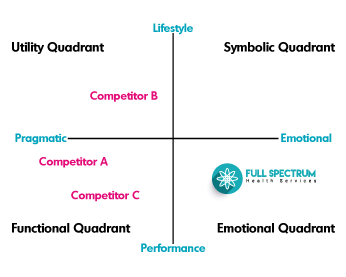 It should come across as an emotional brand, as opposed to a lot of its competition falling in the functional quadrant. By deviating from what their competitors were doing, Full Spectrum’s different look provided another perspective that their customer’s hadn’t seen yet. It also made sense as a way to connect with Full Spectrum’s audience. After all, deciding to pursue homecare options for yourself or a loved one is nothing short of an emotional experience. An emotional brand image for Full Spectrum made sense on all accounts. After determining how we needed to position their brand, we created strategic designs, as well as effective copy, containing the brand language for Full Spectrum’s marketing collateral. This included a website, business card, letterhead, car magnet and brochure. As always, we designed holistically. As a result, Full Spectrum’s collateral was both visually appealing and consistent, highlighting the importance of having one designer manage all print and web collateral. When you have a different designer for each piece of collateral, it is very likely that your brand will suffer inconsistency and confusion. Our brand positioning was a guide to Full Spectrum for social media posts, future copy, content, and marketing campaigns and strategies. We very much enjoyed working with Full Spectrum, and its entire graphic design and marketing process served as another reminder to us that thinking about the big picture is essential. To truly convey what you want to with your brand image, you need to ensure clarity and consistency across all marketing collateral. To read more about our work with Full Spectrum or to see the collateral that we designed for them, visit our case study page!